Are there any answers when someone you love makes a tragic choice? Before and After. That's how Rowan Areno sees her life now. Before: she was a normal sixteen-year-old--a little too sheltered by her police officer father and her mother. After: everything she once believed has been destroyed in the wake of a shattering tragedy, and every day is there to be survived. If she had known, on that Friday in March when she cut school, that a random stranger's shocking crime would have traumatic consequences, she never would have left campus. If the crime video never went viral, maybe she could have saved her mother, grandmother--and herself--from the endless replay of heartache and grief. Finding a soul mate in Eli, a witness to the crime who is haunted by losses of his own, Rowan begins to see there is no simple, straightforward path to healing wounded hearts. Can she learn to trust, hope, and believe in happiness again? warm piece of it back with the other? Sometimes trying a new book by an author that you’ve never tried before can be daunting. But by just reading the first few pages of Me Since You, I knew I would love this book and would read anything written by Wiess right away. Wiess captured the grief that Rowan and her family had to go through really well. Not only that but how people reacted differently when they had to deal with unexpected grief. Rowan’s father had been a police officer for the last twenty years, he’d had his fair share of tough cases to deal with, but had learned to cope with consequences and move onto the next situation well. But the situation he found himself and the backlash that he had to deal with ended up being way too much to deal with. Not only did it have an impact on his career, his way of thinking, but also his family’s life in a major way. It was hard seeing a man, who had such a reputable reputation and such a strong person become a fraction of the man that he used to be right before his family’s eyes. Rowan and her mum were constantly there for him, but sometimes this is never enough. And so the next few weeks were really trying for Rowan and her mother. First of all after everything which happened it was so unexpected, Rowan had several important questions, (highlight to view spoiler) her dad had just ended his life with no explanation whatsoever they knew that the lives he wasn’t able to save, had hit him really hard, but they thought things were getting better. And on top of this Rowan did blame herself for the escalation of events, if only she hadn’t skipped school, would her dad have even been the first one to attend the scene? It was really tough watching Rowan go through this difficult period, (highlight to view spoiler) she really wanted her dad back, but knew that wasn’t possible, so the next best thing could have been some sort of letter, some sort of explanation as to why. It wouldn’t solve everything, but it would give Rowan and her mum that step to move forward with their lives. There isn’t really one singular path to follow when dealing with grief, but having a strong support network can make a big difference. And with people dealing with grief in different ways, it is important this support is there in the sidelines, not being so overwhelming, but also ready to step in wherever possible. This is where Rowan lucked out in some ways and was dealt a bad card in another. Rowan’s grandparents were the sweetest, although we didn’t get to see much of them, they really held Rowan and her mum together. They let them do their own thing for as long as they needed to, but also were there to put their foot down when it was necessary. Whereas Rowan’s supposed best friend, don’t even let me get started on her, it’s usually major life events, which really go on to show you who your true friends are and Rowan was seriously better off without her. Me Since You was a gorgeously written story, despite the story focusing on a really heartbreaking aspect, the story wasn’t bleak at all, and I enjoyed watching Rowan slowly picking herself up and find her place in the world, when a big part of her was missing. Wiess was also able to weave some small “ray of sunshine” moments which were quick to bring a glowy feel good feeling. 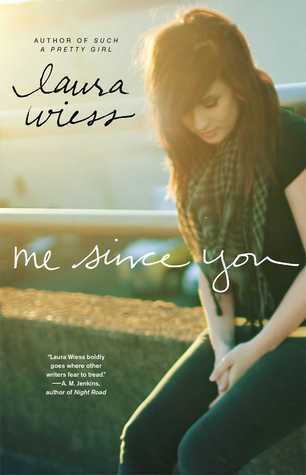 Overall Me Since You really impressed me much more than I was expecting that I cannot wait to read more of Wiess’s books. Thinking about this book just makes me feel all sad again. There were so many moments in this book that made me want to just start sobbing--I had to hold it in because I was on public transport whilst I was reading. I completely agree with every word you said there. Definitely a gorgeous novel. Great review - though I must admit, I shed a few tears just remembering this book. I have read a few books of this type, and some of them don't get it right - this one sounds like it does! I'll check it out and save it for when I want an emotional read. Great review! I agree completely Jasprit, trying an author for the first time can be intimidating because obviously you have no idea what to expect. I'm glad this turned out to be such a great read for you, and now you have another author on your "must have" list! I'm thrilled you mentioned the fact that despite this being an emotional and heartbreaking story, it's not bleak. I can deal with heartbreaking as long as there's hope in there somewhere. Gorgeous review! Wiess certainly made this novel work in that respect, I think if there was too much bleakness, I would have been a bit put off, but Wiess weaved in some lighter moments into the story beautifully! Lovely review, Jasprit. I've heard nothing but good things about this book. It sounds like the author really knew how to capture grief in her words. I'm glad to hear that Rowan begins to pick up the pieces over the course of the book. I need to look for this book at the library. I have the feeling that I'll cry all the way through this. Seriously. I tear up at those stupid, sappy commercials...pretty much at the drop of a hat. It sounds great but sad. Poor Rowan. Don't worry Pooja, this can be heartwrenching at times, but it wasn't as bad as a few other books that I've read recently! I hope you decide to give this book a go! Agree so much with this. I haven't read this yet, no, but I agree regarding have a strong support network/group. When you're feeling at your weakest, when you're absolutely down, you cannot force yourself to stay strong. When we're grieving, it would be important to have someone else be strong in your place and hold you together as you put together the pieces in your life. Yes make sure you have some tissues at the ready Faye! Wiess was able to focus in on support networks wonderfully in this book! "Not only that but how people reacted differently when they had to deal with unexpected grief." That is very true, because not everyone reacts differently and even though this is such a hard and painful topic to reflect it's still interesting to see people's coping mechanisms. Blaming oneself is always the worst. I feel so sad for Rowan. I'm so happy that you liked this book and enjoyed the characters quite a bit. I wonder what the best friend did since you obviously didn't like her at all. Gorgeous review, my friend! Ugh the best friend was such a pain! She was just so self-centered when it was clear that Rowan needed her support the most! And thank you lovely! sounds like a really hard-hitting, but well written story. I love these type of books. They are often difficult to read but they show sides of humanity that do exist. Yes I totally have to agree with you there! Oh I like the sound of the writing and I am glad that this isn't a bleak read considering the topic, I need to reconsider this one. I have tears in my eyes just thinking about how awful it must have been for her AND for her dad. (As expected) I did have a look at the spoiler and it's breaking my heart. I am kind of annoyed with the idea of a bad friend though. :/ I hate hate hate bad friends. I am so glad to see you enjoyed this one! Thanks lovely! I hope you decide to give this book a go, as everything else is written so eloquently, that you sort of forget the best friend after a while! I'm not sure I can handle such a heartbreaking story at the moment. But I agree that, when dealing with a terrible loss, support from your loved ones can make all the difference. Although it pretty much depends on the person. The writing in this sounds absolutely gorgeous. I'll definitely keep it on my list for when the mood strikes. Thanks Maja! Yes the writing is amazing in this book! I hope you enjoy this if you decide to give it a go! Loved how grief was portrayed here, so realistic and an important read! Everything about this book, gah! I read it recently and oh my lord. The first third didn't grip me emotionally, but I got so attached and so- gosh, it was such a good book. You hit the nail on the head here Jasprit and you really reviewed such a tough book well, and I'm so glad you enjoyed it too, man I cried in the end, oh man.. I love powerful, issue-based books, and I've never heard of this one before. I feel like it's the type of novel to be just hard-hitting enough to leave a lasting impact. This is definitely going on my TBR now. Great review, Jasprit! I do love it so much when I make an inmediate connection with a story. Me Since You seems like such a powerful story. Great revues, Jaaprit! I've read a lot of good things about this book!! I haven't read any of this author's books either and I get nervous to try new authors sometimes. But this one is next up on my Nook, so I hope I like it as much as you! It does sound emotional though!! I skipped this one because by reviews I've read, it didn't sound very promising. That good? I'll have to get back to it. Great review, Jasprit. I been wanting to read this one since so many people liked it, but I also been warned about the sad and heartbreaking moments. Since I am going through a lot in personal life right now, it's been put on the back burner. Sorry for the delay in comments. It's been a very long month. Thanks for letting us know that the story wasn't bleak at all. I think I'll enjoy the characters, their strengths and resilience. Beautiful review, Jas! I am SO happy you enjoyed this one!! I thought it was such a beautiful story. And yes it's heartbreaking but I loved that it also focused on learning to move on you know. To pick up the pieces and find a way to live with the grief. I love how realistic it was. Grief is not just something that ends after a week you know. And omg yes her best friend! Don't get me started on her either!!! Wonderful review, Jasprit!! I can see you snapping your fingers as you say, "Don't even get me started on her" for the best friend, which makes me smile. I'll definitely be picking this one up now because I think this is just what I need right now. I love how she's dealt with hurts, but we're also given something good to hold onto during her journey. Love the review!